The historic settlement of Okarito was built on a sand-spit within the bounds of the Okarito Lagoon. Originally a Maori settlement and then a busy gold mining town, the village lies between the forces of the Tasman Sea and a natural landscape of wetlands and rainforests, dominated by the highest peaks of the Southern Alps, including Mt. Cook/Aoraki and Tasman. Okarito proves that history is not just preserved in museums. Its restored buildings can give you an insight to what it was like to live in a gold mining town. It is hard to imagine this quiet holiday village as a town that was once the third largest port on the West Coast. There was even a daily newspaper and the fully surveyed plans for the "Colonial University of Okarito." Drive 15 km north from Franz Josef Township on State Highway 6 to the Okarito Forks turnoff signposted on the left. Drive 13 km along a sealed road to Okarito. For more information explore the Okarito Community Association website. During the gold rush of the 1860s the Okarito wharf saw over five hundred miners disembark in one day. Vessels arrived from New Zealand, Australia and the rest of the world. The resident harbour master strictly enforced maritime law and ensured there was no loose behaviour. Okarito grew to be the third largest port on the West Coast. For over a decade there were regular services sailing directly to Australia. The sand bar across to the Okarito Spit is still treacherous and the Waipara, which served the community for years, sank in the Okarito channel in 1873. You can see a picture of the shipwreck on the information displays in the boat shed which also detail the history of Okarito. It is also worth taking a closer look at the Department of Conservation display board set outside and around the corner from the main door of the boat shed. It will give you some insight in the biodiversity in the Okarito Lagoon, which is New Zealand's largest unmodified wetland. If you are time-rich a kayak or boat trip is an ideal way to get up close and personal with this unspoiled environment. 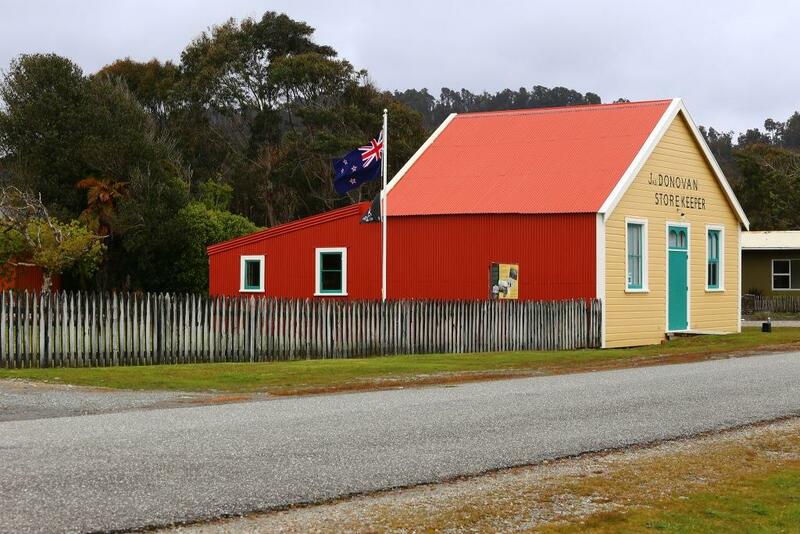 Donovan’s Store is the oldest wooden commercial building still standing on the West Coast and takes pride of place in the centre of the Okarito village. It was once the Club Hotel, built in 1865. It was rumoured that the bar girls offered the services of a brothel to selected customers in its gabled roof. In the 1890s James and Eva Donovan converted it to a general store and its doors were kept open on a regular basis right through to 1987. Mr Donovan was a well-respected member of the community and even stood for local government. The Okarito Community Association and the Department of Conservation have worked hard to restore and preserve the building. It now hosts many lively community events and a small library. Look at the flyers on the main door to see if you can be a part of a yoga class or catch a performance by a travelling artist, poet or musician. For more information, see the Department of Conservation website at www.doc.govt.nz. The building that you see today was constructed in 1901. The original school-house was built in 1867 and was once the centre of a thriving community. As the population dwindled so did the school roll. In 1946 the school closed its doors for the last time at the start of the long summer holidays. The next year the school aged children travelled to either Whataroa or the Franz Josef Glacier village. By 1958, the paint was scabbing, the foundations sagging and the building was on the verge of demolition. The local community with the help of the Greymouth YHA undertook a major restoration project and the building was reopened as YHA shelter for travellers in 1960. In 1990, the Department of Conservation, the Okarito Community Association and the Greymouth YHA initiated a complete restoration project. The modern kitchen facilities were added, and the bathroom area remodelled. All the money for the project was raised by the Okarito community. Today travellers from the world over take up the unique opportunity to stay in this historical building that seems to still ring of the chants and calls of past school days. For more information, see the Department of Conservation Website at www.doc.govt.nz. Abel Janzoon Tasman went in search of a promised land with rich trading potential for the Dutch East India Company. His two ships, the Zeehaen and the Heemskerk, landed at Punakaiki on the West Coast of the South Island on December 13 1642. The cenotaph on the edge of the Okarito village green is a monument to both Abel Janzoon Tasman and Judge James MacKay. Tasman was the first European to sight New Zealand and Mr Mackay more than anyone helped encourage the settlement of the West Coast. In 1858, he was accredited with the settlement between the local Maori tribes and the crown for 7½ million acres of land between Kahurangi Point and Milford Sound for a meagre £300. Thousands of native birds (more than 76 different species) visit the lagoon and many make their home in the vicinity, including the famous kotuku/white heron and royal spoonbills. The kotuku is sacred to Maori and its only New Zealand breeding colony is north of the lagoon on the bank of the Waitangiroto River. The breeding site is a nature reserve, open from late October to the end of February and requiring an entry permit. White Heron Sanctuary Tours, based at Whataroa, operates trips into the colony. Okarito Boat Tours take guided trips on the lagoon or you could hire a kayak from Okarito Nature Tours and explore the lagoon yourself. A small population of rowi (Okarito brown kiwi) exists in a 98 square kilometre area where the Department of Conservation manages a kiwi recovery programme. Okarito Kiwi Tours can take you out to visit these very special birds in their home. For more information on all things avian see www.birdingwestcoast.co.nz. Just 30-35 minutes drive from Franz Josef Glacier village. Journey north via State Highway 6 past Lake Mapourika. The turnoff to Okarito is well signposted. While at Okarito check out Okarito Boat Tours, Okarito Kiwi tours and Okarito Nature Tours if you want to go for a paddle on the lagoon!